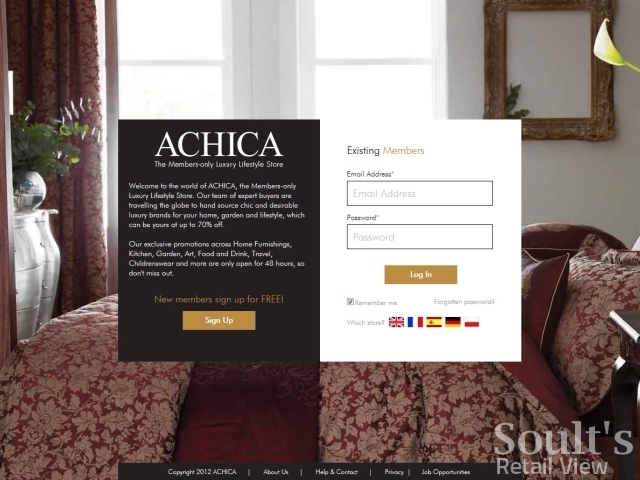 Since its launch less than three years ago, the private sales etailer Achica – badged as the “members-only luxury lifestyle store” – has been something of a quiet success story. Launched by Asos co-founder Quentin Griffiths in partnership with former TradeDoubler CEO Will Cooper, the business’s strong online pedigree seems to have stood it in good stead. Though the Achica brand is, I would argue, quite some way off achieving the ubiquity of an Asos or Amazon, the firm’s UK membership is around a million, and its website is performing well in terms of visitor traffic. 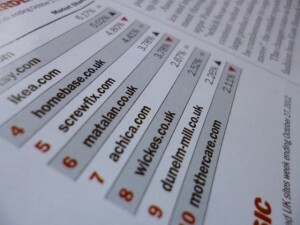 Only last week, Experian Hitwise data published in the print edition of Retail Week placed Achica at number 7 in the chart of “10 most visited UK house and garden sites” for the week ending 27 October 2012: behind big names such as B&Q, Homebase and Matalan, but ahead of the better-known Wickes and Dunelm Mill. Achica’s finances aren’t in bad shape either. 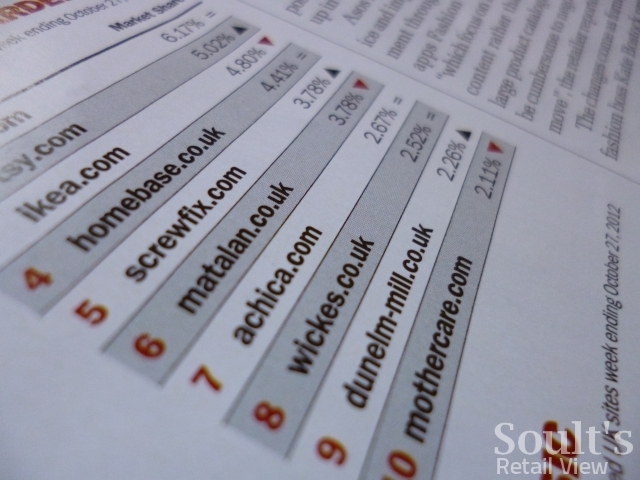 Turnover has “rocketed” (reaching £60m in the last financial year), and the company has even started to break even – an achievement that many online retailers struggle for years to achieve. Recent launches in overseas markets, alongside plans to build margin and differentiate product through growing its fledgling own-brand offer, seem to provide Achica with a viable route to profitability. Of course, any retailer’s long-term success ultimately depends on the quality of the experience it offers its customers, with social media and online review sites making positive word of mouth more critical than ever. 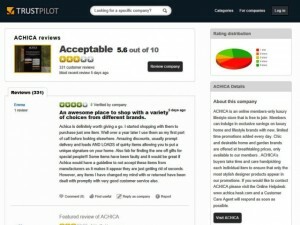 On this basis, anyone Googling ‘Achica’ today might be alarmed to see its 5.6 out of 10 Trustpilot rating – based on 331 customer reviews – showing up as the third result. Glancing at the most recent reviews, feedback seems split between those praising the “wonderful offers” and others expressing disappointment with slow delivery or “poor customer service”. 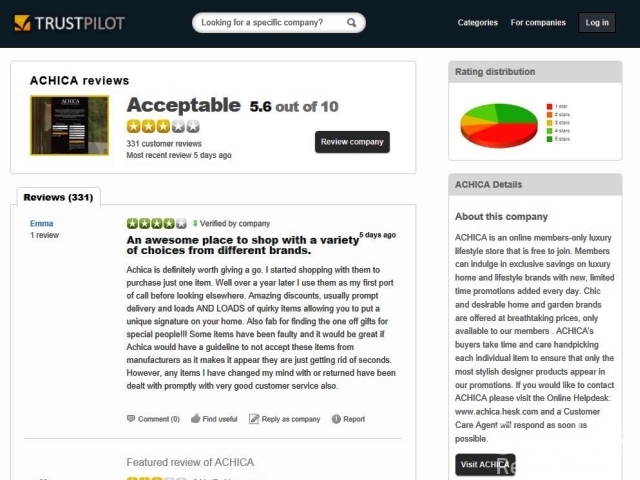 To its credit, Achica seems reasonably proactive in responding to feedback via the Trustpilot site – a crucial step for any retailer in managing its online reputation – and its rating, while not as good as, say, Matalan (7.7) or indeed Asos (8.0), is in line with other UK online retailers operating in the home and garden sphere, such as Wickes (5.2), Homebase (5.0), Dunelm Mill (4.8) or B&Q’s DIY.com (3.9). Still, that’s no excuse when all retailers should, ideally, be aspiring to get a 10 out of 10 rating from every customer they serve. Hence, when Achica’s PR people asked whether I’d like to carry out my own shop and review the experience for Soult’s Retail View, I was happy to oblige, promising to look honestly at all aspects of the shop from first impressions to product information, delivery time, packaging, and the quality of the goods themselves. So, armed with £45 to spend, courtesy of Achica, what did I find? And how far, if at all, has Achica addressed the issues that I highlighted and fed back at the time of my shop? Achica’s logotype and overall visual identity embraces the understated monochromatic look beloved of many home and lifestyle retailers at the moment. However, as Debenhams, House of Fraser, Next, Zara and others have found, it’s an effective – if slightly overused – way of creating a look and feel for their brand that is elegant, conveys quality, is relatively timeless, and works across a variety of media. 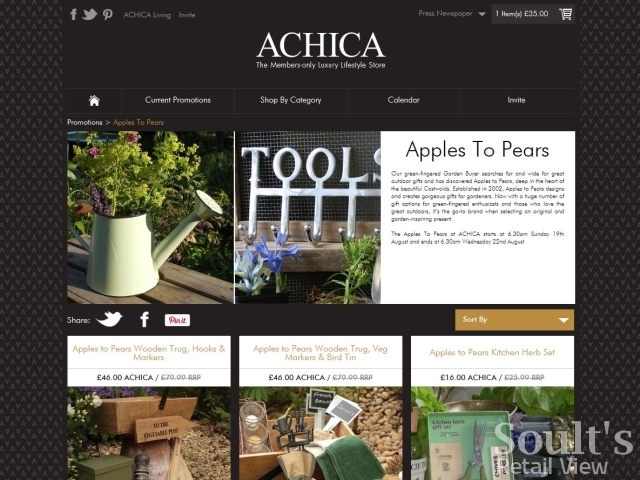 Online, it can be especially effective in allowing rich and colourful product photographs to really zing, as they do on the Achica welcome page. First-time visitors to the Achica site need to register in order to proceed any further, while there’s a login box for existing users. However, users who have registered for the site and ticked the ‘Remember me’ option are taken to the homepage proper without having to log in again. Interestingly, the current welcome page (above) has been simplified since my first visit (below), giving more space to the bold and attractive background image by trimming the introductory text, reducing the overall clutter, and simplifying the information that new users need to provide upfront: just their email and password are required now, rather than the first name, surname and ‘how did you hear about us’ answers that were all required before. This is certainly a positive change, both in terms of making a good visual impression and ensuring that as few hurdles as possible are put in the way of customers signing up. I was initially given a special media username and password to enter the site, so didn’t need to go through the process of setting up my own account. Once registered or logged in, users can explore the site properly and see the products and offers that are available. 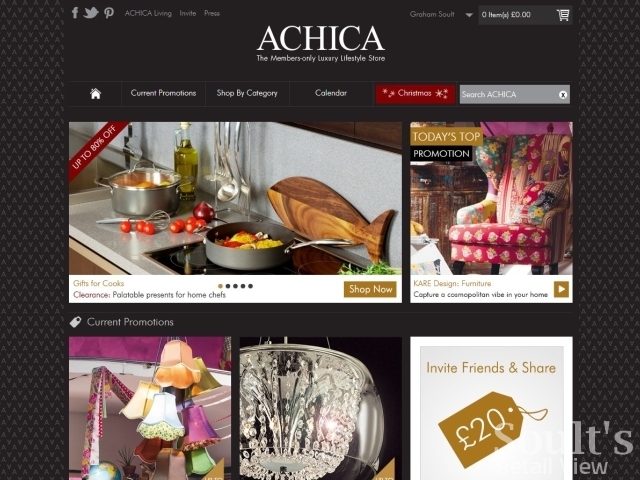 Achica’s USP as an online store is that its range and brands are constantly changing, with each private sale running for just a few days or until stocks run out – rather than being a traditional department store, like John Lewis, it’s a bit more like a membership-only version of TK Maxx, where a large part of the appeal is not quite knowing what you’ll find on any given visit. This approach to selling underpins the layout of the homepage (below), which highlights “current” and “top promotions” and also includes a prominent menu link to the upcoming ‘Promotions Calendar’. Complementing the daily email updates that users can opt to receive, the calendar alerts customers to what’s coming up in the next few days, and, rather usefully, allows them to add those events directly to their Outlook, iCal, Gmail or Yahoo! calendars. Again, this represents a slight change from how the site looked when I first visited (below), with the calendar and promotions now given greater prominence, and the menu of shop categories – covering Furniture & Lighting, Kitchen & Dining, Electrical, Bed & Bath, Home Accessories, Garden & Outdoor / Sports, Children & Nursery, Fashion Accessories, Food & Drink, Art & Design, and Travel – condensed into a single ‘Shop by Category’ dropdown. As with the welcome page, this has had a notable impact in reducing the page’s clutter, and makes it easier for Achica to accommodate extra categories, Amazon style, should it choose to add these in the future. The most significant change to the homepage since my initial visit, however, is the addition of a search tool. 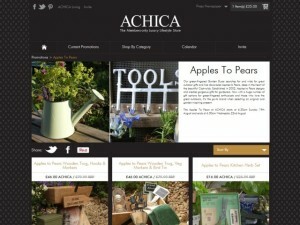 Back in June, I found navigating the Achica store frankly quite a frustrating experience. 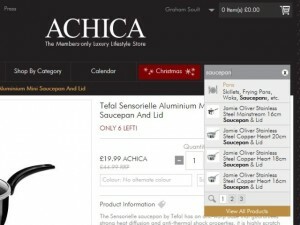 With no search function, items in each product category organised by brand rather than type, and no way to view all the products in a category at once without browsing each brand in turn, my impression was that you really wouldn’t choose Achica if you were looking for something specific. To some extent, of course, the sense of exploration, surprise and, potentially, inspiration are what make Achica different from a straightforward department store or homewares retailer, while the ‘Luxury Lifestyle Store’ tagline and elegant, lusciously illustrated site conjure up the feel of flicking through a style magazine or Sunday supplement rather than a traditional ecommerce site. However, having a distinctive and upscale brand is little use if customers get fed up trying to find anything. Happily, all these issues have now been addressed. The new search box displays a dropdown list of matching products as you type your query, allowing you to click through directly to your chosen item. Similarly, clicking through from the menu to a product category immediately displays a photograph and summary of all matching items, which can then be narrowed down by type. Today, for example, customers visiting the ‘Kitchen & Dining’ page can choose to refine the results by selecting or deselecting the options ‘Kitchen Textiles’, ‘Bins & Storage’, ‘Kitchen Knives’, ‘Kitchen Accessories’ and ‘Pans’. By making these changes, the site is immediately much more user friendly and intuitive. The initial plan was that rather than placing my order via the site, I’d just let the PR people know what I wanted to order within the £45 budget. 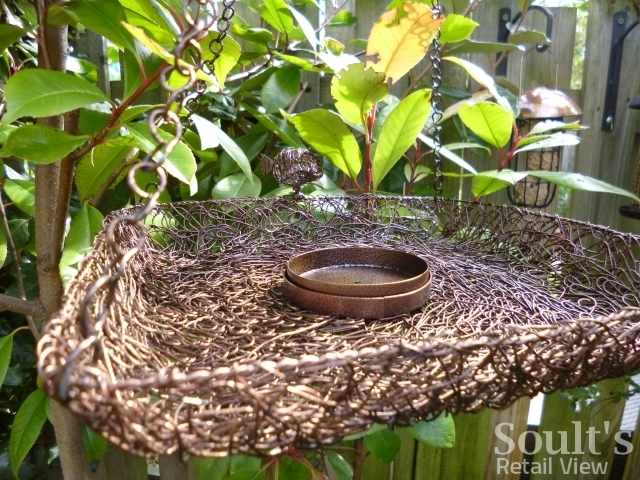 Given that I link to relevant blog posts from my Garden & Landscape Directory and Home Interiors Directory sites, I figured it would make sense to split the budget between one home and one garden item. 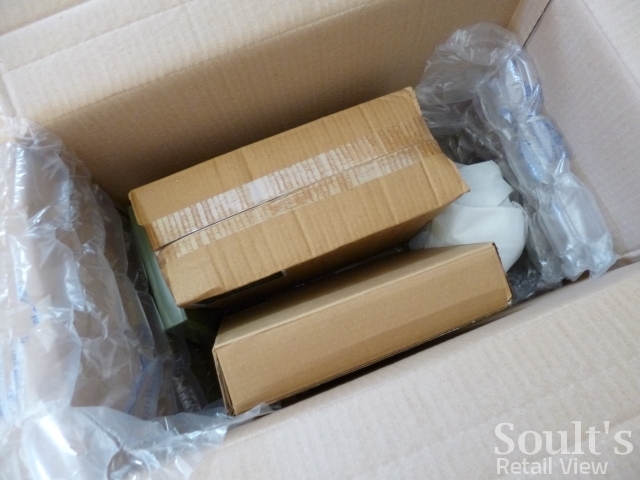 Ordering more than one item is also a good way to put online retailers’ packaging to the test, given the need to protect one item from the other – especially if, as in my case, you opt for an 18cm saucepan at £25 and a bamboo lantern at £18.50. Unfortunately, things didn’t get off to a great start. Requested on 13 June, the items were expected to arrive at my address, I was told, in “about 15 working days”. Two months later, however, there was still no sign of any order, apparently due to it somehow getting “lost” at Achica’s end. While the honesty was appreciated, losing the order hardly seemed a great way to impress someone who was expressly tasked with reviewing the customer experience. Still, honest mistakes happen, so I was prepared to give it another go, this time using a voucher code that would require me to set up my own user account and place the order in the same way as any other customer. On the plus side, this would also give me more insight into the actual customer experience in terms of registering on the site, receiving notifications, and so on. Given Achica’s rolling sales format, the items I’d requested originally were obviously long gone, so it was back to the drawing board as far as my order was concerned. Armed this time with £65 from Achica (to include the extra cost of shipping), I decided to choose a selection of home and garden items from the attractive Apples to Pears range, a brand that is sold in stores such as John Lewis, Amazon, Menkind and Blooming Direct, and that had, I later noticed, a prominent presence at September’s Autumn Fair in Birmingham. 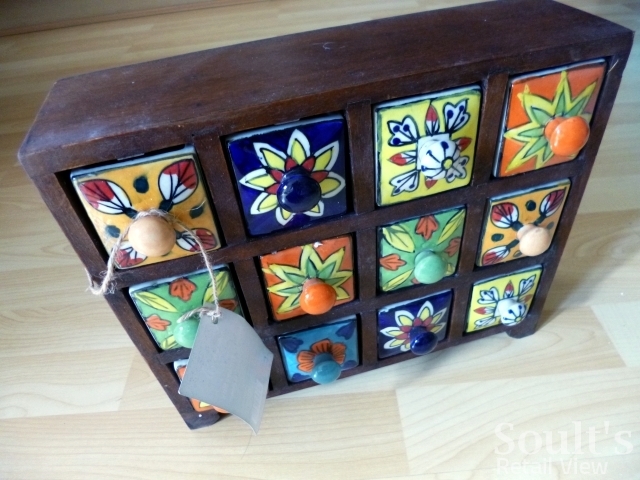 Having registered for the site on 20 August, I successfully placed my order – for a 12-drawer spice chest (£35), folding pocket secateurs (£7.75), a filigree tray bird feeder (£5.00) and a ‘chick watering can’ ornament (£7.25) – a little later the same day, with delivery coming in at £7.95. Within the hour, a ‘Thank You For Purchasing’ email appeared in my inbox, restating the expected delivery date of 12-19 September, followed, slightly unhelpfully, by a somewhat tardy ‘Thank You For Registering’ one. 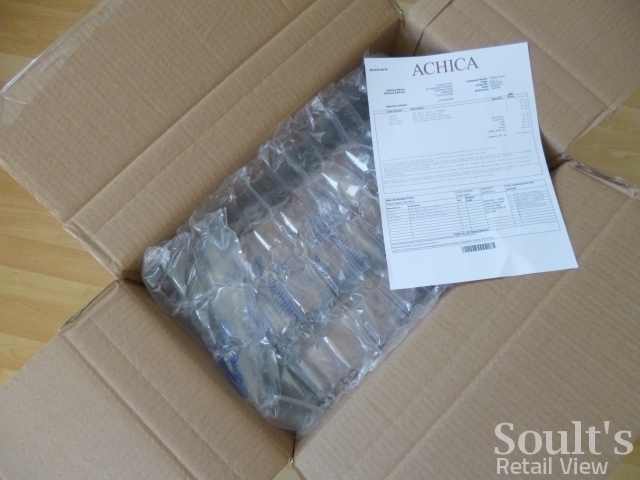 Based on people’s expectations of other online retailers, Achica’s shipping costs and relatively sedate delivery times both catch the eye, and are worth scrutinising more closely. While free delivery is certainly not a prerequisite of a successful online store, customers demand that what they are charged is fair and transparent, and I think this is an area where Achica can do better. Though its FAQs page sets out the delivery costs for different destination countries and weights of parcel, I was surprised that there’s no way to know how much the shipping of your specific order will cost until you’re some way through the checkout process. I couldn’t see any information about shipping costs on the product pages, and there’s no reference there to how heavy the items are, which would give you some idea of cost if you’d looked at the chart on the FAQs page beforehand. If I were a normal customer, I wonder whether this lack of clarity might put me off ordering. Moreover, my perception of the weight of items isn’t very good, so the final cost of delivery was actually less than I expected having reviewed the pricing chart on the FAQs page. Under the ‘Delivery & Returns’ tab on the product page it would be easy enough to add a note along the lines of “UK delivery on your order of 0-2kg will be £4.75”, which I think customers would find helpful. On the second issue, of delivery times, it’s reasonable to argue that four weeks is really quite a long time to wait for any online order these days. 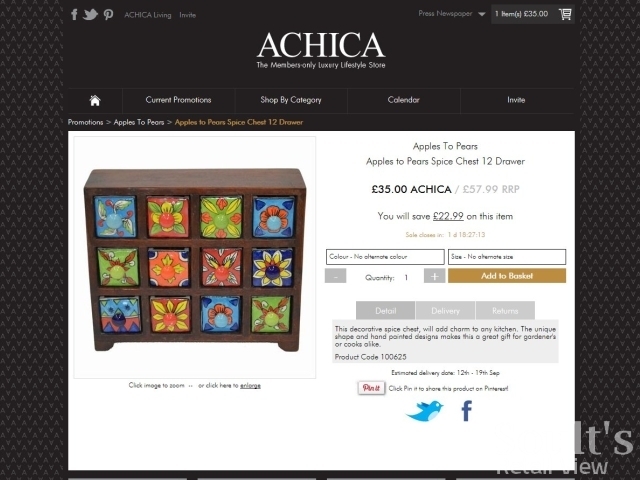 For example, compared against big-name etailers such as Next and Very offering next-day delivery for less than £4, Achica’s statement that “we aim to deliver most items within 15-20 working days from the close of the promotion” does seem rather out of step with modern customers’ expectations. While the FAQs page attempts to communicate the reason for this – explaining that “we are able to offer such great prices because we work hand-in-hand with the brands. Purchased goods are shipped to our warehouse for repacking and delivery to the member’s destination, which elongates the delivery time” – it’s a statement that should, arguably, be more prominent. In the end, my package from Achica arrived a little ahead of schedule, on 7 September – 13 working days (or 18 actual days) after placing the order. Unhelpfully, however, the email from DPD telling me that “your order is due for delivery between 12:17-13:17 today” was only sent at 09:06 the same morning, which wouldn’t have been much use had I been out that day and needed to rearrange. Oddly, this was then followed by two identical emails from Achica itself telling me that “the following item(s) have now left our warehouse”, the second one arriving just 15 minutes before the DPD delivery man. 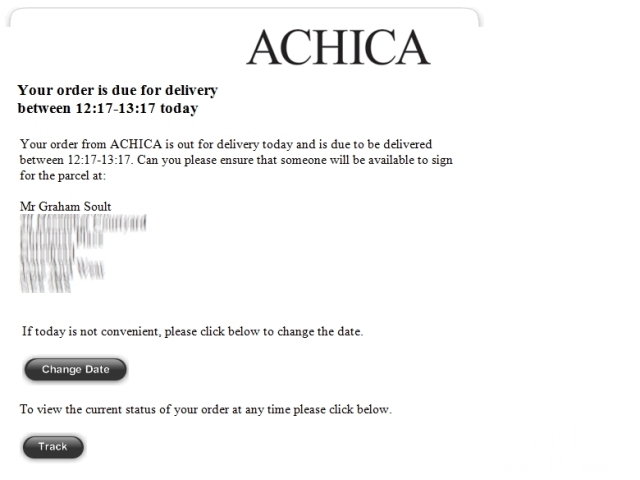 While the 12:32 delivery time fell safely within the promised window, I felt that the timing of Achica’s emails, as at the start of the ordering process, could have been better. As for the parcel itself, I was very impressed with the quality of the packaging. Bubble wrap on top and at the sides ensured that the items in the box were well wedged and not rattling around, while the spice cabinet and bird feeder were individually boxed. I was also pleased to see that the ornamental garden chick had been carefully foam wrapped and positioned to prevent it being squashed or damaged by the larger and heavier items in the box. 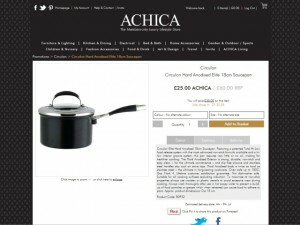 The products, finally, were all as I expected, and matched the images and descriptions given on the Achica website. The decent packaging ensured that they all arrived in good condition, and I was pleased with the quality of the items. So, no issues on that front. 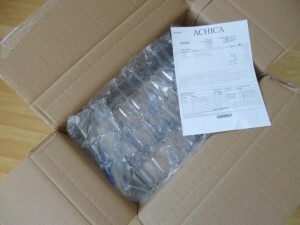 Moreover, I do seem to have got a good deal by ordering from Achica. 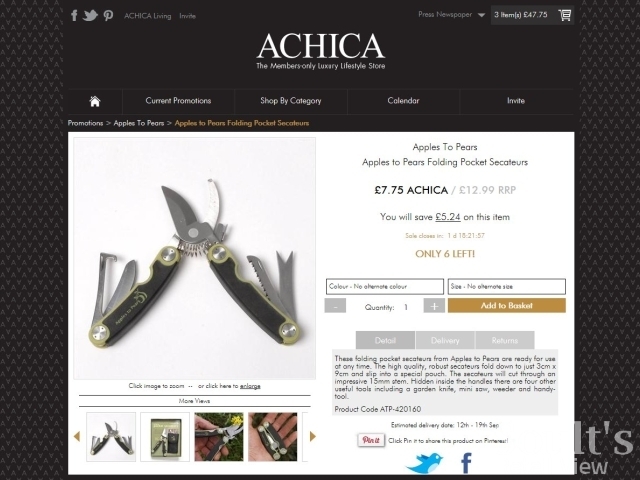 Checking Amazon.co.uk today, for example, the spice chest (£35 at Achica) is currently being sold for £50 plus £3 delivery (via Gardening Delights), while the secateurs (£7.75 at Achica) are £8.99 plus £2.75 p&p via Apples to Pears’ own Amazon shop. Overall, it’s easy to see why Achica is doing pretty well. Its online store is attractive and elegant, the products are appealing and seemingly keenly priced, and the ‘members only’ private sale format builds a sense of exclusivity and excitement that clearly strikes a chord with customers. Though I had quite big reservations about the site’s usability when I first visited in June, it’s positive to see that these have been addressed since, making the store much easier to navigate by either category or search. As it happens, the areas where I think Achica can most improve do seem to accord with the customer feedback reviews that I mentioned earlier. Firstly, I believe Achica can do more to inform customers about the likely cost of delivery before they get too far along the ordering process, and it should look at how this information can be integrated into the product pages. 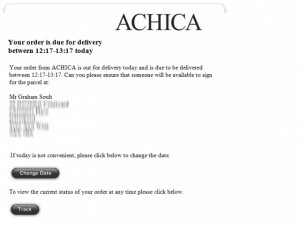 Secondly, email updates relating to registration, ordering and delivery are a crucial part of keeping customers informed and happy, and Achica needs to make sure that its own emails are both timely and sent in the right order. Finally, good communication about order status is especially important when the delivery time is several weeks and the expected delivery window quite wide. Though Achica has a reasonable argument for why its delivery time is longer than other retailers, I feel this could be communicated more prominently on the site. Customers will only accept a four-week wait for their goods if they understand how and why that’s an integral feature of the Achica offer, and if all the other parts of the experience – from navigating the store through to email communication, packaging and product quality – are individually and collectively superb. 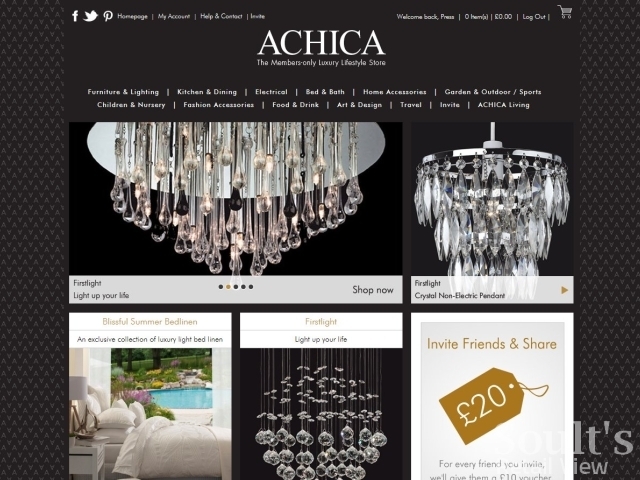 On that front, as things stand, it’s maybe a 7 out of 10 for Achica from me: a generally good experience, but with scope to do things better, slicker and cleverer as the business continues to grow. All Trustpilot ratings mentioned in this post were correct on the day of visit (8 November 2012). Experiences and screenshots of the Achica website are based on visits that took place on 12 June, 20 August and 8 November 2012. My retail consultancy business, CannyInsights.com, helps retailers improve customer experience by critiquing the appearance and usability of their content websites and online stores. For more information on how CannyInsights.com can support your business, visit www.cannyinsights.com, drop me an email, or give me a call on (0191) 461 0361. Recently ordered a mattress topper, they sent wrong item. It was promptly returned and received by their warehouse. They confirmed receipt of item and agreed to refund within 2-4 working days. I waited over a week before contacting them again when they accepted that due to a administrative error the refund had failed. I was asked to wait a further 3-4 days. No refund was ever received eventually I had to contact my credit card company. They are a faceless organisation, contact is only via emails, they take days to respond and do not keep their promise. There is no way to escalate issues. Avoid at all costs. I returned two bedside cabinets on the 20th June as I was told they were unable to replace a damaged cabinet, (but then told later they could after they realsied that the order was nearing £1,500). 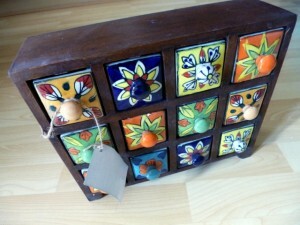 I only received a credit for one cabinet, after repeated requestes to have the other £299 credited we are still waiting. We have been told absolute rubbish as to why i t has been delayed, also, that it has been approved for payment. We are nearing just handing this to our legal people and also claim compensation. ACHICA are renowned for holding on to your cash after feading similar reviews. Our advice to potential customers of ACHICA is quite clear. DO NOT BUY ANYTHING FROM THIS SUPPLIER, VERY POOR CUSTOMER SERVICE AND 2nd CLASS GOODS. Lol, was just about to make an order with Achica when I decided to check reviews. After reading this lot don’t think I’ll bother!!! I am sure Achica are raking in the profits, two very rich gentlemen have found the key to making a few more million! Advertise stuff that companies cannot shift at prices that can often be beaten on other sites, take everyone’s money immediately the order is placed. Try not to answer anyone’s enquiries when things go wrong and hope those irate customers give up the ghost. It would seem there are enough gullible people out there apparently willing to be treated like idiots. They have no contact telephone number, they send insipid, uninterested and totally unhelpful e mails to enquiries. They talk about shipments, or problems with suppliers…..I DO NOT CARE , it is Achica who have taken money for my order, and here I am 51 days later with just 4 items, out of 11 ordered, a reimbursement for 2 items that will never be delivered, and no idea at all, in spite of 3 e mails to them, as to whether the rest of my order will actually arrive or not. Best of all? Try going back into your account and re- finding your enquiry or their answer, it seems to disappear…..Steer clear of this company and please let us make a point to these two entrepreneurs that you cannot get away with this scandalous treatment of customers for long! My order of the 1st February did not arrive after weeks of waiting. I have been promised a refund on 4 occasions to date, yet it never seems to arrive. We have experienced the same problems, I don’t mind waiting for items over the due date but their lack of customer service is unreal when you think these days communication is only seconds to do. Contacted them numerous times and nothing back yet this began in December. This is a company that I would really like to purchase loads more but considering they knew this gift was for February and still nothing from them, I thinks it’s time people stop ordering until they wake up and realise what a bad deal we are getting. They take your money out of the bank asap but no goods received – some sort of criminal act I would say. I have Tried to contact the CEO of Achica too but nothing back. Trading Standards is my next step. Do not buy you will not receive your goods. I’m so glad I ventured in here as I was considering buying an item and now realise it’s not worth the risk/hassle. I really see nothing to be gained from doing a review without being anonymous as common sense says they’d bend over backwards to get it right. My main bugbear is the impersonal customer care. Nothing beats airing your grievances to an actual person. I might add that viewing stats re Achica’s sight mean very little really. I’ve been a customer since it’s inception, view it every day,sometimes twice and have never bought anything and I dare say I’m not alone. I should also say that today I ordered a console table from an Irish company that was recently on sale on Achica. £247 on Achica and €247 at Vobeinteriors. Exactly the same table yet much cheaper taking exchange rates in to consideration. Basically Achica are just carrying out a PONZI Scheme, taking money to pay debts and where more sales done refund customers. Has to be my worst customer experience ever. Like many Achica customers, I have been left feeling very frustrated. I am 58 days from placing an order that has never arrived and STILL waiting a refund of my £300.00. I cannot believe that Achica are still trading in this manner. I would critic this Company again, Graham Soult, perhaps under an alias. I am sure you would find your story would be VERY different. Seriously? This company is a disgrace. I am amazed…no, totally astounded….that your goods arrived well packaged. They must have singled out your order for special packaging. In fact, I am sure that all the packaging they’ve left out of my parcel, they must have used in your’s. To send two heavy glass lampshades covered with one carelessly wrapped piece of bubble wrap? Are they mad? I ordered two funky lightbulbs to go with my glass lampshades. These were in the same outer delivery box, but didn’t even get the benefit of the bubble wrap. I opened each (plain, unmarked) box containing said funky lightbulb, only to find out that the glass of each bulb was covered in greasy fingerprints. I don’t even think I’ve been supplied with new goods? They look like someone who’s just eaten a meal with their fingers has decided to take down their lightbulbs (BEFORE washing their hands) and stuff them into a too-small box that’ll just about do, and then send them to me. No doubt, when I ask for a replacement I won’t get it. And then when I ask for a refund Achica will sit on my money for as long as they can get away with it before I take legal action against them. As you can see from earlier comments, I am not alone in my thoughts about this company, whatever the so-called “pedigree” of it’s founders. Poor customer service! No customer care contact telephone number. Poor delivery. Will not use this company again. Still awaiting refund…….3 weeks down the line!! I have to say that when things started to go wrong with achica last year I thought it was a one off bit I did order quite a few items from them, one being a a Knomo wheels case for £79 which on order three months and then never arrived. I had I to email customer services and eventually my money was returned. 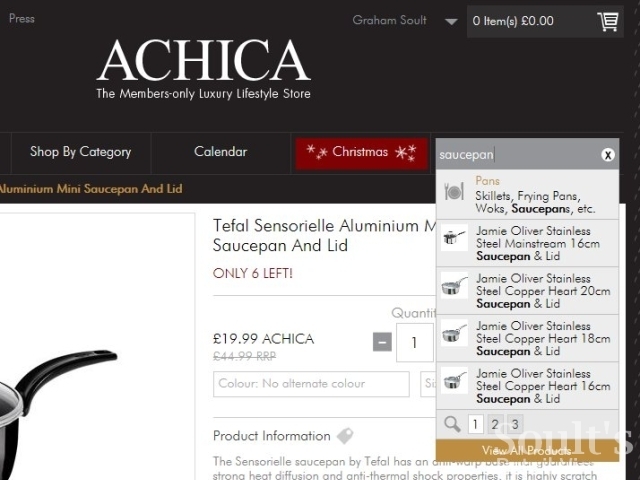 The items they sell can not be fulfilled especially if it is a popular item and in the meantime Achica are using your money for other outgoings. I did not use them for six months giving them time to improve their delivery and customer service and order a set of cutlery in January this year. The set arrived 3 weeks after I ordered it and is such a disappointment. Very cheap metal and not substantial at all. The description certainly did not match the actual goods and I promptly put it back in its original packaging. The item is very heavy and I have asked them to range for a courier to collect as the postage will be over £20 and I would not get is back. Achica need to smarten up their act and start listening to their customer as they are rating on their laurels and think at cheaper items will keep bringing I the business and eventually they will sell out to Amazon. This is a couple of rich men trading on the good will and money of their customer. I have never felt compelled to write a review before but I ordered goods on 14th November – order stated delivery would be 16th to 21st November. Have emailed the company 3 times and all I have received is 2 automated emails. still not received goods. I would strongly urge others not to use this company as they are incapable of customer service. They do not call you, you cannot call them. They do not keep you up to date. It seems they take your money and then leave you high and dry. Future buyers beware! No doubt the goods will arrive faulty now! We ordered two large items in October, and had some very confusing emails from Achica & the courier re delivery process. Finally someone phoned from the courier and arranged delivery date. I took a day off work yesterday and stayed in all day – nothing! Received an email today to inform me that delivery would be today 12-3pm (as per the review)Not useful at all. Can’t find any contact details for either company. We won’t be using them again. 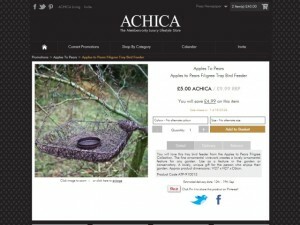 I have purchased a few items from Achica and was told delivery could be up to 3 weeks (eh?!!!) 4 weeks on and nothing except emails giving me future dates. What is so frustrating is no contact number to speak to someoe. Has anyone out there got a phone number of this company? Why isn’t Achica listening? Achica seems oblivious to customer’s complaints. Their lack of accessibility and responsiveness to emails is a sure way of killing repeat custom. It could be seen as an arrogant attitude. I too am a frequent shopper on this site ,my difficulties are with delayed deliveries and extortion postal charge.As i live in northern Ireland my delivery charge seems to tally 14.95 regardless of how many items i”m actually purchasings .Yes i agree with previous customer there is no telephone no to contact anyone direct which is a hindrance. they owe me over £600 through a combination of not receiving items and a couple of returned items – i have spent thousands of pounds with them and am disgusted bu their zero customer service – you can’t call them to have a conversation.